The extreme delay machine that you’ve never heard before. In short: This is a Karaoke echo machine. Words spoken in the iPhone’s microphone will come back a few seconds later. It’s like the echo effect you can hear at a mountain. 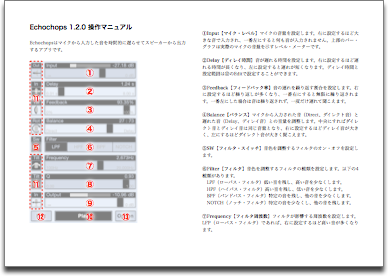 You can get various kinds of effects by changing the delay time and the feedback rate. To make music: Tap on the table – it sounds like “tock”……”tock”…..”tock”….. Clap your hands – you’ll hear “tock”, “clap”, “tock”, “clap”, “tock”, “clap”… You can produce simple musical patterns this way. Daily life use: Leave it as it is. It’s fun to hear repeating sounds of ordinary life. You can use the stereo headset with the mic. Take a walk with the iPhone in your pocket and enjoy the repeating sounds around you. 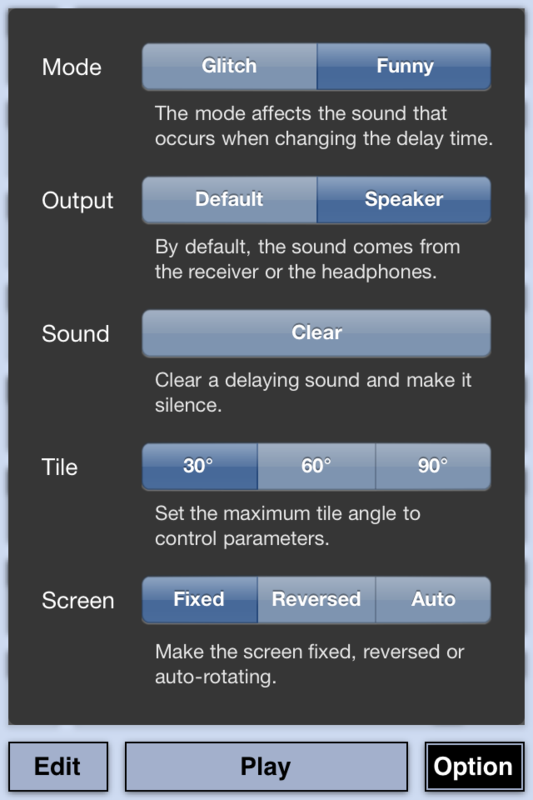 In detail: “Echochops” produces a feedback delay effect (an echo effect) on the sounds from the iPhone’s microphone. The feedback delay is widely used to produce rich vocal and guitar sounds. It is also used as a special kind of musical performance. 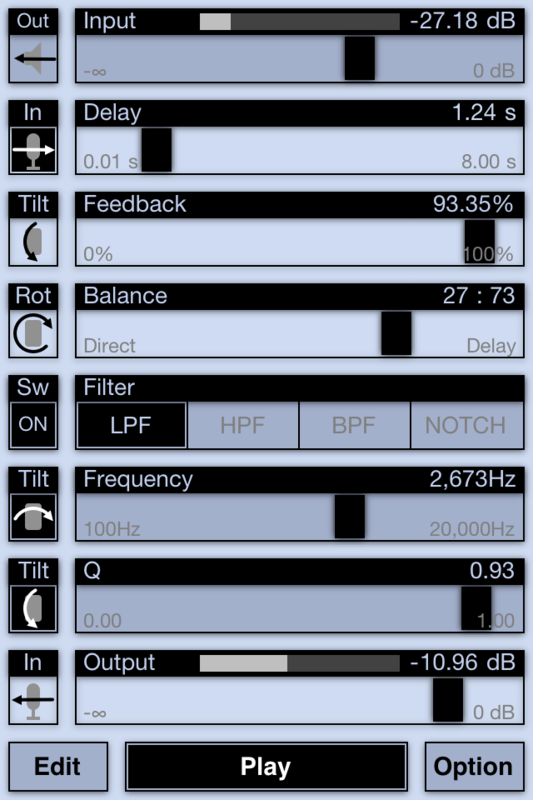 You can use “Echochops” not only as a “musical” application but also as a “noisy” experiment. Delay time setting, within 60 seconds. Mode setting to change delay time, “Glitch” or “Funny”. Output route setting, headphone/receiver or speaker. [[ ATTENTIONS ]] Due to a latency of an audio input and output, the actual delaying time will be slightly longer than the setting. A natural feedback through the air may happen because the microphone and speaker are placed closely on the iPhone. Distorted sounds or harsh grating noises will be produced depending of the setting of parameters. It would be better NOT to use this application if you cannot stand noisy sounds. [[ Address of Gratitude ]] The version 1.2.0 was approved and released on October 15 , 2011 so that we sincerely dedicated it to Steve. I bought echochops for my 3GS. But it doesn’t seem to record. The screen shown in the App site which has the circular dots never shows. I’m not sure if this might be operator error or something else. Hi James, It’s just an imaginary image that is not shown in the app. I should make it clearer. Sorry for that. This seems like a fantastic app… will it support audio interfaces which use the 30-pin connector, or will it only use the internal mic / headphone jack ring input? Hi maurojv, It works properly on my iPhone 4 and iOS 4.3.5. It might be good to restart your iPhone. 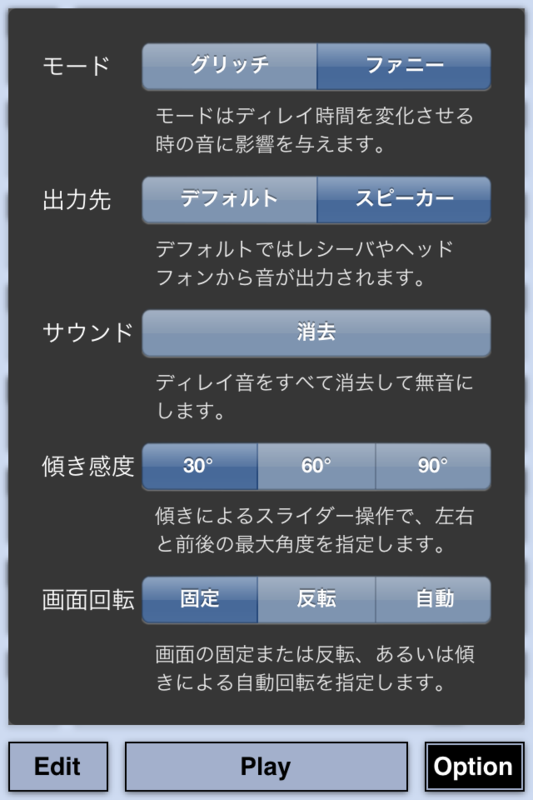 Please try to change some settings and options, for example, “Speaker” in Output option. i bought echoshops too for my iPhone4 but the program doesn’t record anything. I understand that the program can do but I can not put it to work. which is the record button and which the play button? 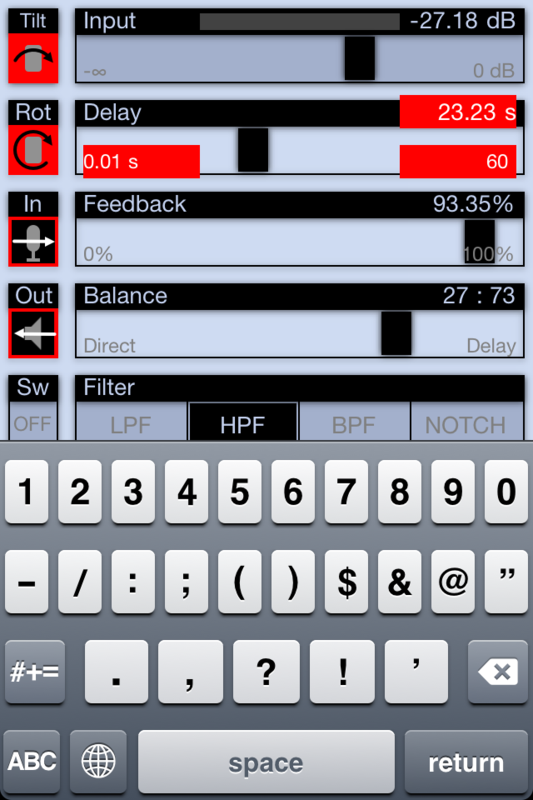 Hi maurojv, Echochops is a “delay effect” application so that it has no “record” button. Just tap “Play” button and then it works. I love the app but just found out that it is not going to be supported in iOS 11. Is there a chance that it will be updated and become available in the app store again? Thank you for the wonderful app. If you are interested, I’d love to tell you how I used the app. Thank you for reporting. I’ll update it someday soon(?). Let me know what you are doing.